Inline Media has collaborated with Goodwill Industries of Denver on media strategy, media planning, and traditional, digital and social media buying since 2011. Prior to working with Goodwill as a client, my perception of their mission was very limited. I visited their retail location near my home to drop off gently used clothing and household items, purchased jeans for my kids to wear during paintball tournaments, etc. I felt good knowing the proceeds would help individuals with disabilities or disadvantaging conditions. In my media strategy work with Goodwill, I’ve become aware of the extensive scope of ALL that Goodwill does in the community and it was an eye-opener to say the least. In addition to providing meaningful employment for folks with intellectual and developmental disabilities, they lend a helping hand to those with less noticeable challenges. · Goodwill has mentoring programs for at-risk teens in local Denver high schools? · Goodwill assists adults who have fallen out of the workplace due to legal problems, substance abuse and homelessness with career counseling, placement and friendship? · Goodwill supports a program that helps rural Coloradoan farmers and ranchers stay employed despite long term illness, permanent injury or aging? 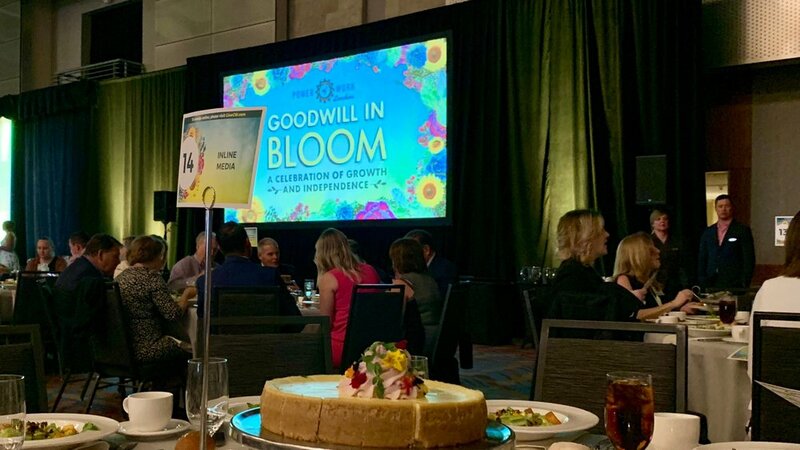 Inline Media supported Goodwill at their annual “Goodwill in Bloom” luncheon last week. Year after year this event provides inspiration for our agency as Goodwill honors individuals who have participated in their programs and have experienced personal victory. This transformation has tremendous ripple effects that trickle down to family members, friends and the community. This year’s luncheon presented awards to four individuals whose lives truly blossomed after their introduction to Goodwill’s support and career training. We heard from the recipient’s friends, families and Goodwill case workers about what a blessing and a joy it is to see adults with intellectual and developmental disabilities meaningfully employed at Goodwill. These Goodwill employees say it’s not just a job, it’s their family. For Inline Media, it’s not just a job, it’s our community. Our work as Goodwill’s advertising agency allows us to lend our expertise to a client that does vital work in our community. Events like the “Goodwill in Bloom” Luncheon provide a reminder of just how life-changing that work is. Goodwill Celebrated their 100-year anniversary in 2018. Visit Goodwilldenver.org for more information on how you can be the “We will” in Goodwill.